It may seem like a neologism but it is not. In fact all over the world children have always been the most docile, the most blackmailed and the cheapest work force available to unscrupulous employers. According to the figures of international organizations, today in the world there are 150 million children who do jobs that endanger their mental and physical health, condemned to a life without leisure or education. 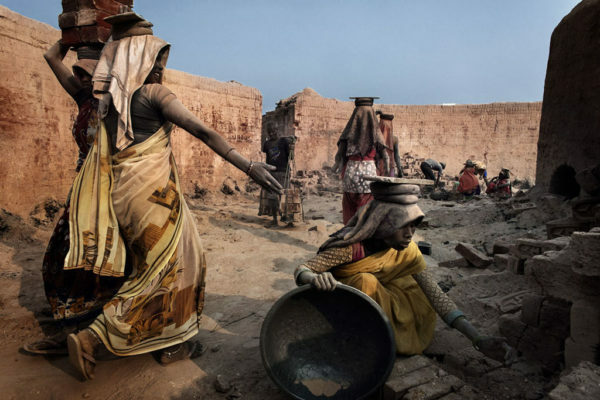 Among the categories most at risk there are the children working in the furnaces.Throughout most parts of the world, bricks are made by hand. 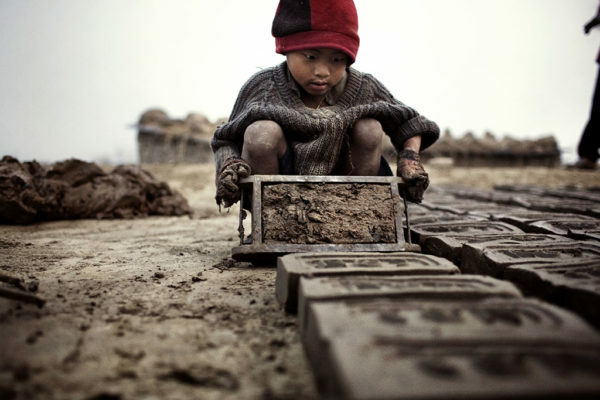 In Asia, Latin America and Africa, children dig clay for bricks using shovels, picks and awls. 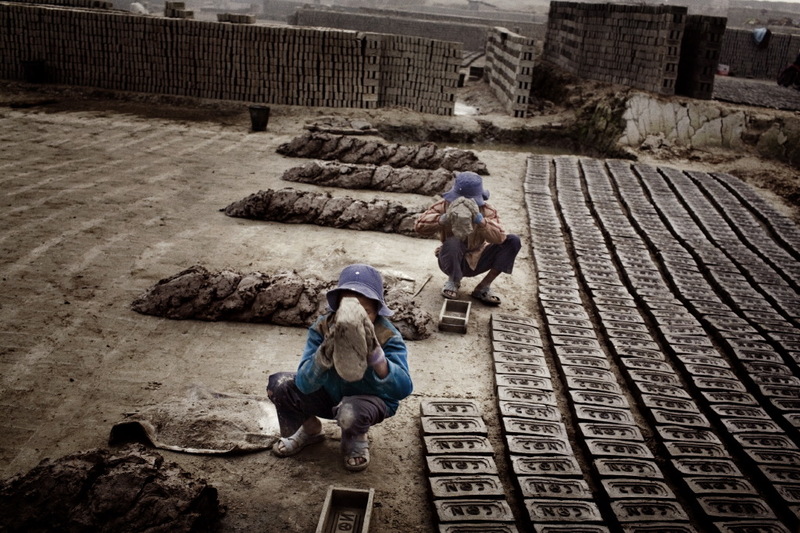 After mixing the clay and water to achieve the proper consistency, workers form bricks using small wooden moulds. 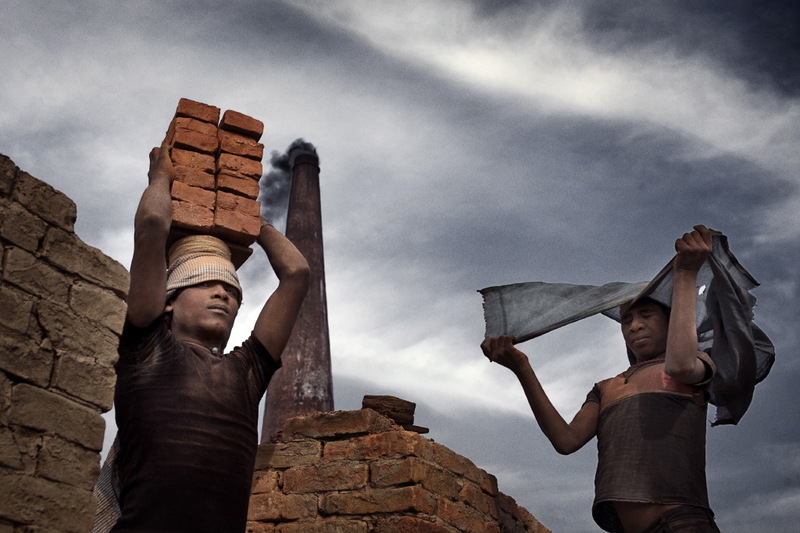 When the bricks are dry they are first transported to the ovens to be cooked, and then, once done, they are loaded onto trucks who then take them to distribute them to construction companies. 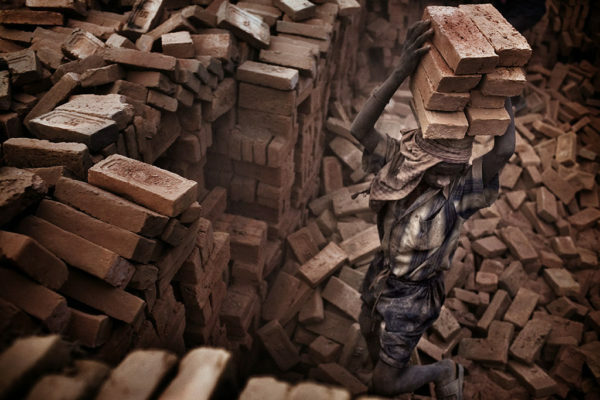 Each brick weighs up to 4kg, and a child may carry on his head or shoulders up to 1.000-2.000 bricks per day, 12 hours every day. The daily pay varies depending on the number of bricks handled and can be as low as 10 USD for every thousand. The International Labour Organization (ILO) has estimated that over 40% of Nepal’s children aged 5-14 were working in 2007 – 2.6 million in total. 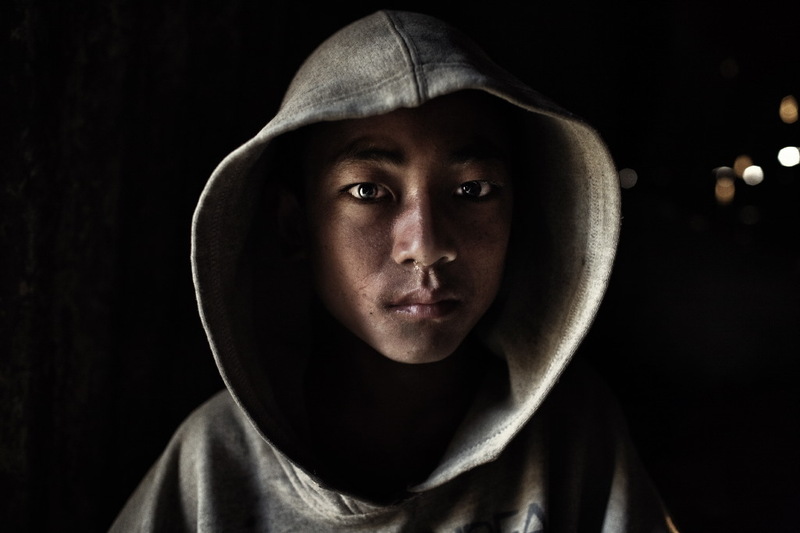 Nepal has an overall young population – the average age of its 29 million inhabitants is 20 years old –and child labour is present in most areas of the national economy. 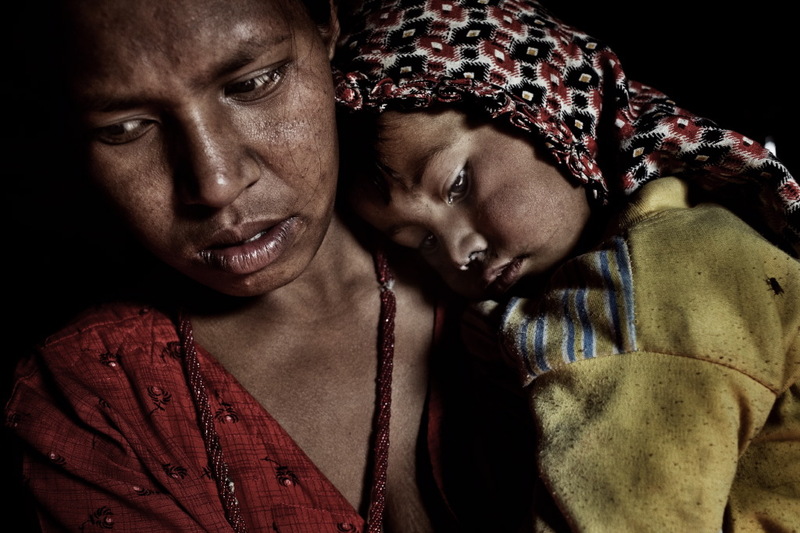 In Nepal there are 900 furnaces, 500 of which are in the Katmandu valley. It has been calculated that the furnaces release approximately 837,000 tons of dioxin. (text by Luca Catalano Gonzaga). Kathmandu Valley, Nepal. 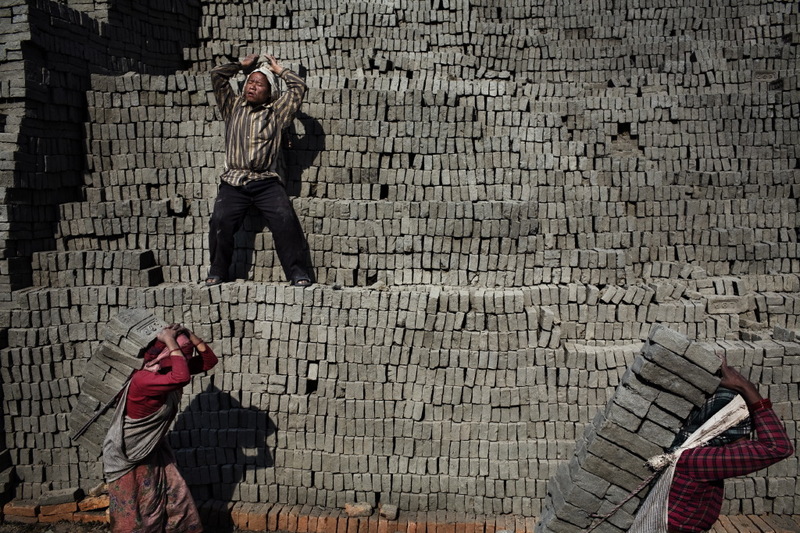 At 7 a.m. Yadhuy, 4 years old, has already started preparing the bricks about to be baked. Kathmandu Valley, Nepal. 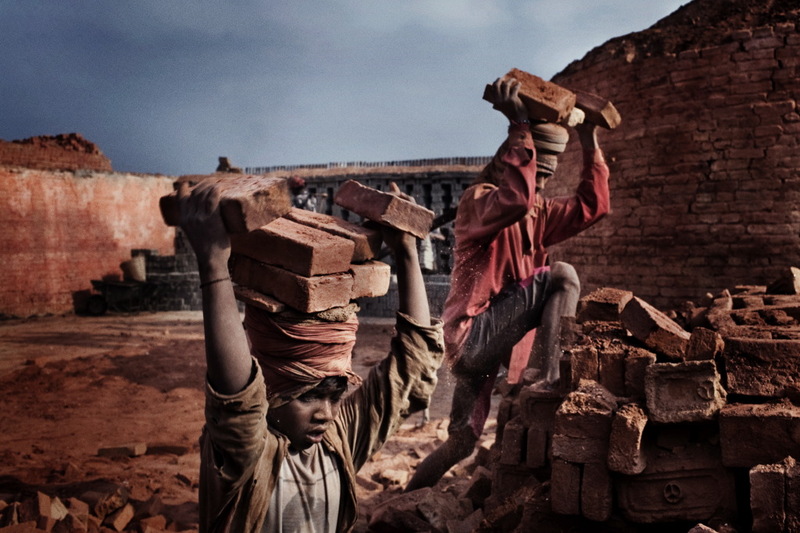 6:30 am, Ramesh, 5 years old, and his brother Prakash, 6 years old, are working to contribute to their family’s income. Kathmandu Valley, Nepal. Transportation of bricks to be cooked in the furnaces. Kathmandu Valley, Nepal. Sarita 17 years old, prepares to carry 24 bricks on her back. Kathmandu Valley, Nepal. 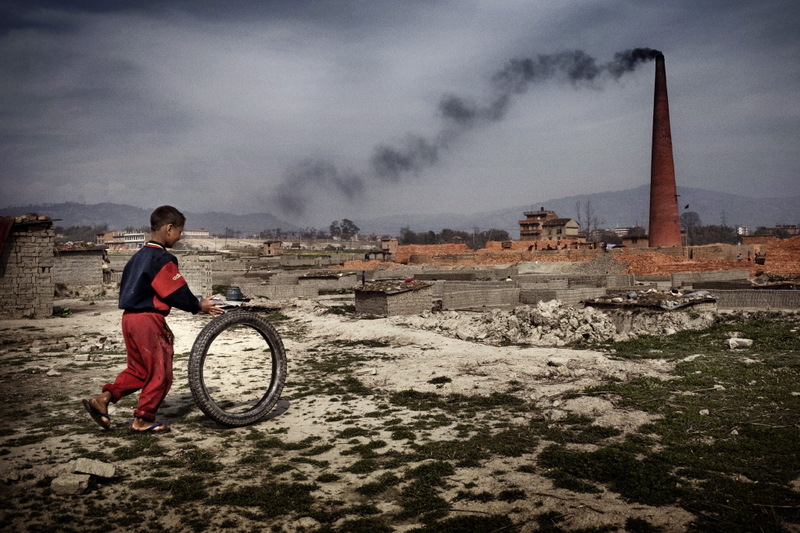 Kanan, 12 years old, receives a receipt for having transported bricks from the furnace to the truck. On average for a whole day, each worker performs at least 150 transportation trips earning as little as $ 4. Kathmandu Valley, Nepal. Sarita 6 years old, at dawn,tries to warm up from the cold. Kathmandu Valley, Nepal. Punya, 14 years old, at dawn, rests and protects herself from the cold. Kathmandu Valley, Nepal. Transportation of bricks to the furnaces in Kathmandu. Kathmandu Valley, Nepal. 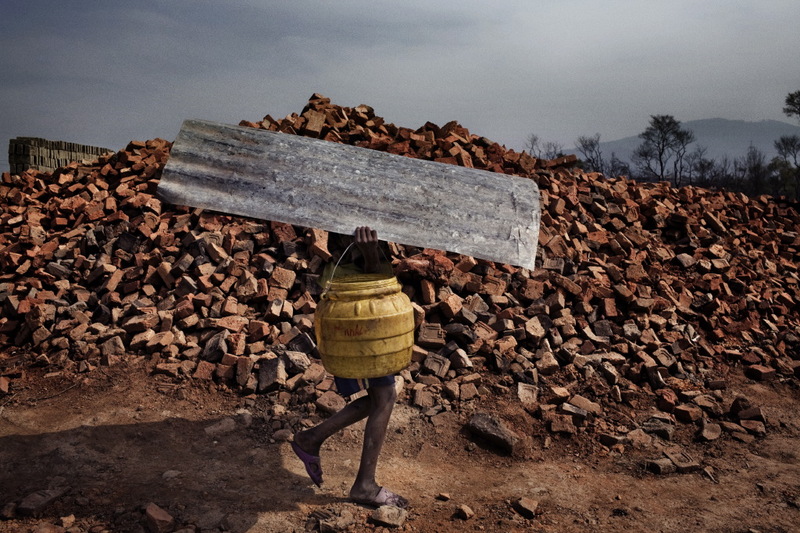 Karna, 15, while carrying bricks. Kathmandu Valley, Nepal. 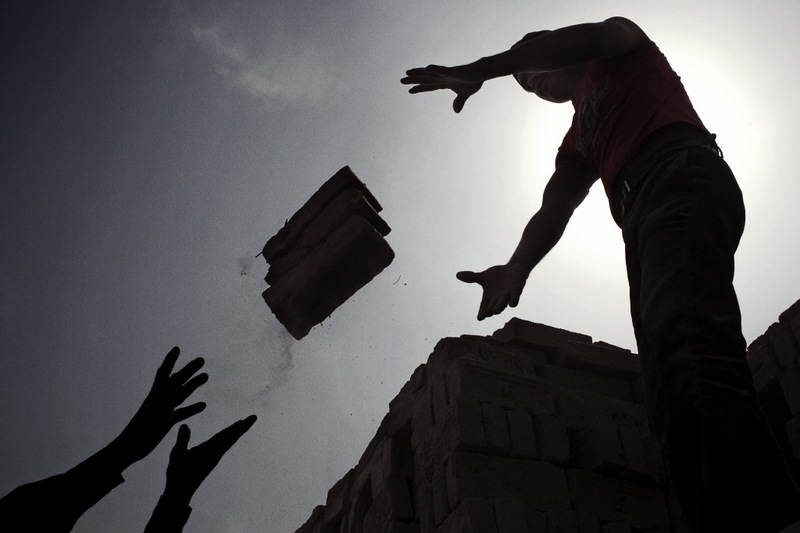 Karna, 15 years old, carrying bricks. Many furnace workers are immigrants coming from India. Kathmandu Valley, Nepal. 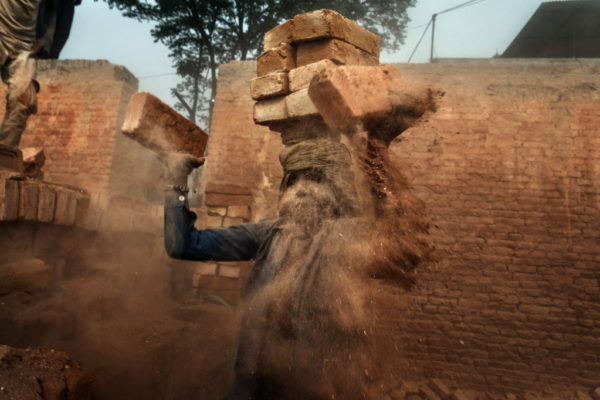 Young worker loading bricks on his head, creating dusts which cause respiratory system diseases. Kathmandu Valley, Nepal. 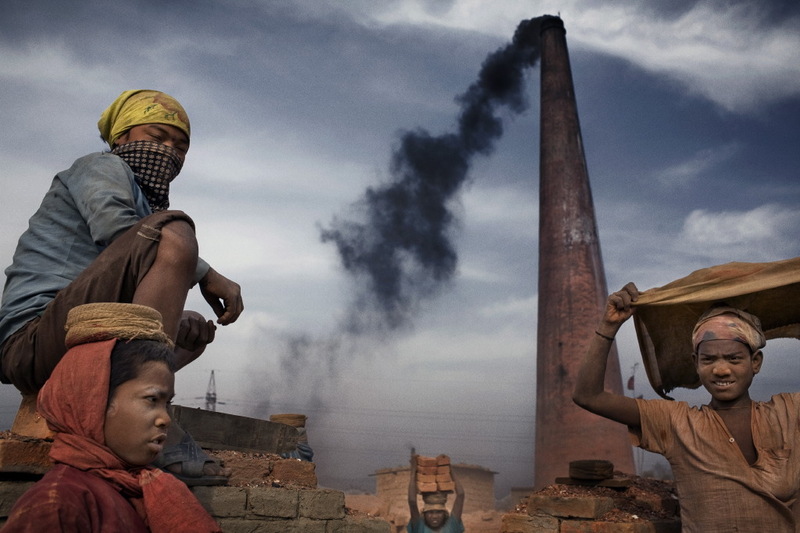 A moment at play close the furnaces in the Kathmandu valley. Kathmandu Valley, Nepal. Preparation before transporting the bricks. Kathmandu Valley, Nepal. Young child at work. 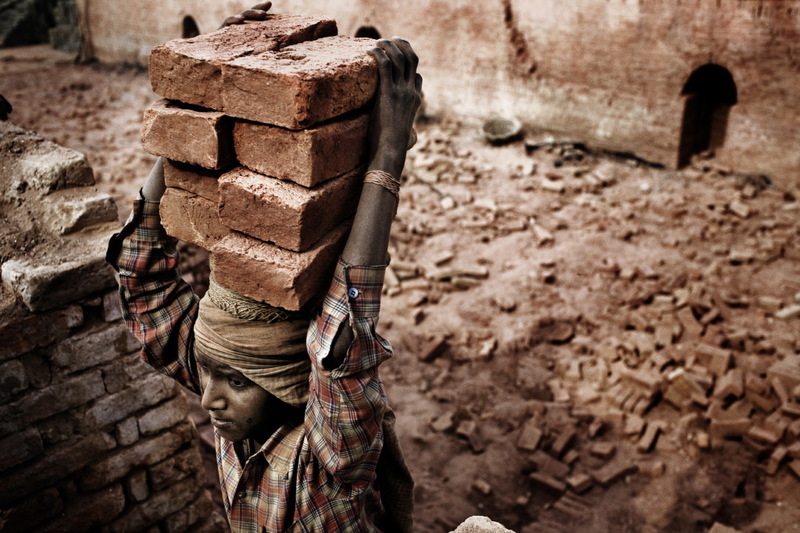 A child may carry up to 1.000-2.000 bricks per day. For a total of 12 working hours. Valle di Kathmandu, Nepal. 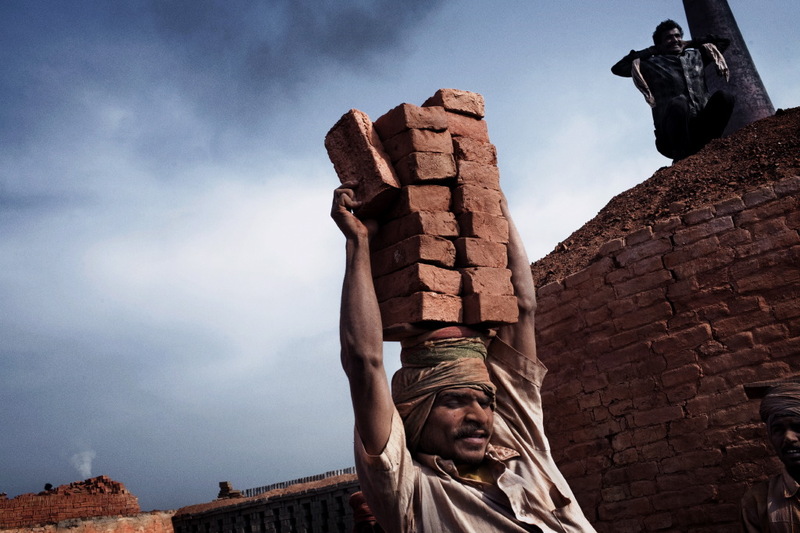 Each brick weighs up to 4kg, The daily pay varies depending on the number of bricks handled and can be as low as 10 USD for every thousand bricks. Kathmandu Valley, Nepal. 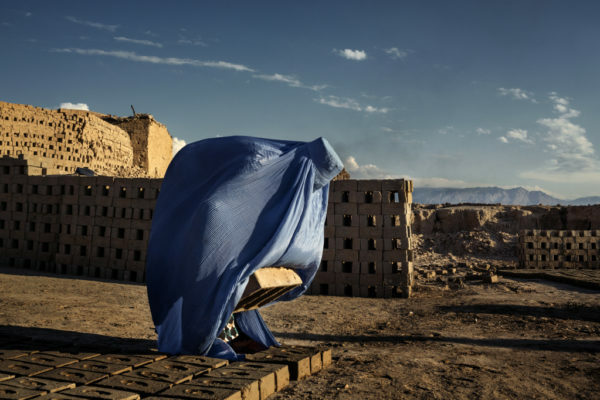 Kamal, 12 years old,from India, while she transports brick, wearing the same clothes for over three months. Kathmandu Valley, Nepal. Transportation of metal plates to build huts close to the furnaces. Kathmandu Valley, Nepal. Young workers preparing to load bricks on their heads, headed to the lorries for transport. Kathmandu Valley, Nepal. 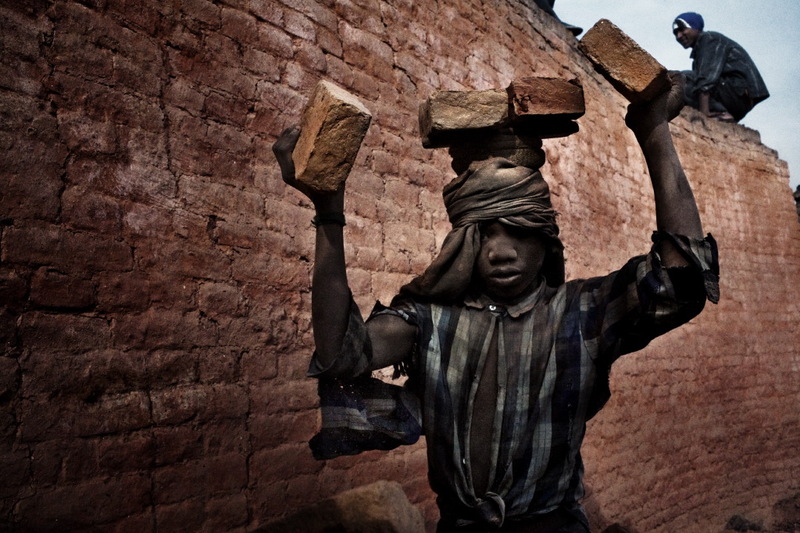 A young worker prepares to carry bricks, wrapping his head with a cloth. Kathmandu Valley, Nepal. 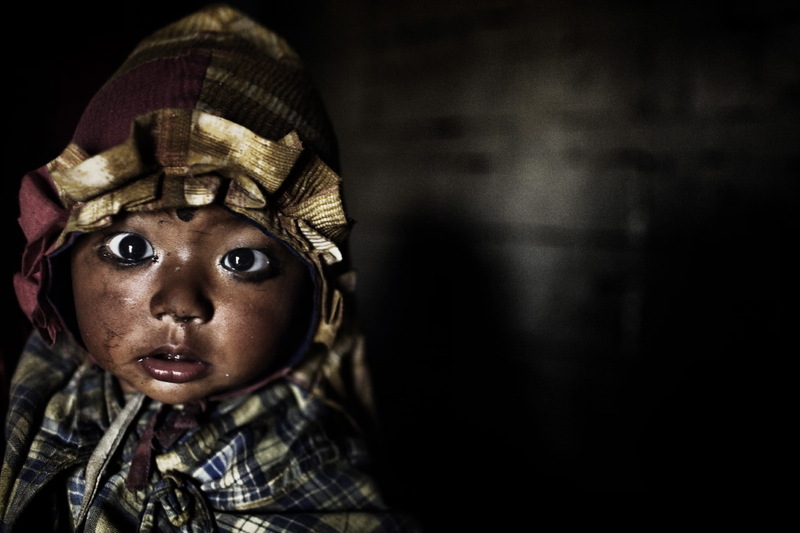 Krishna, 2 years and 6 months, daughter of furnace workers, lives in a house built close to the furnaces. Kathmandu Valley, Nepal. 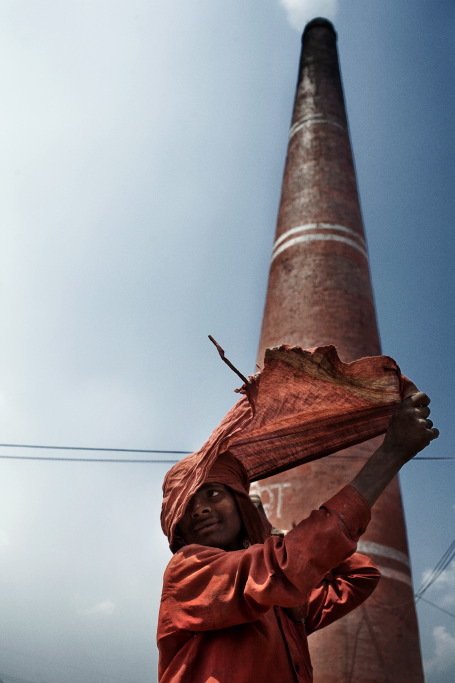 Mukti Ram, 16, a young worker. Kathmandu Valley, Nepal. 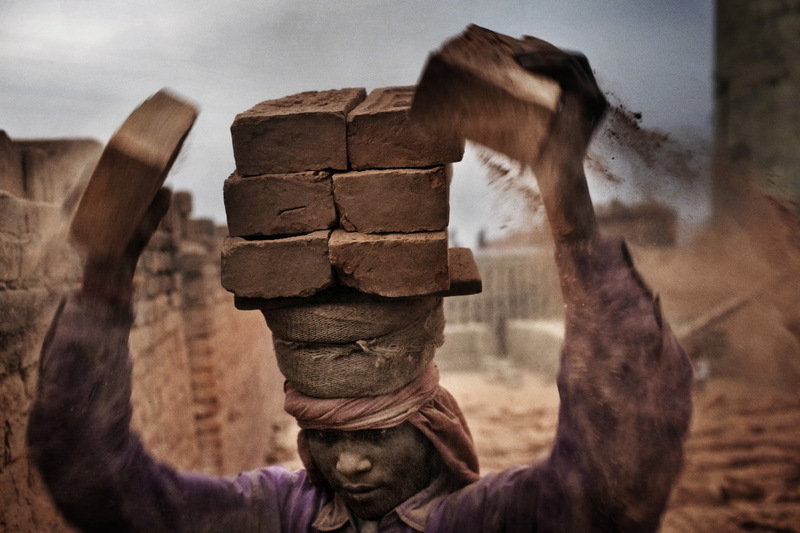 At 4:30 am in the morning, Dhanyata, 16 years old , preparing bricks before being cooked. Kathmandu Valley, Nepal. Mother and daughter having a small rest in their home.